Driving to Anchorage from Seward recently, we spotted these sandhill cranes at Potter Marsh and decided to park the truck and walk out onto the boardwalk for a closer look. 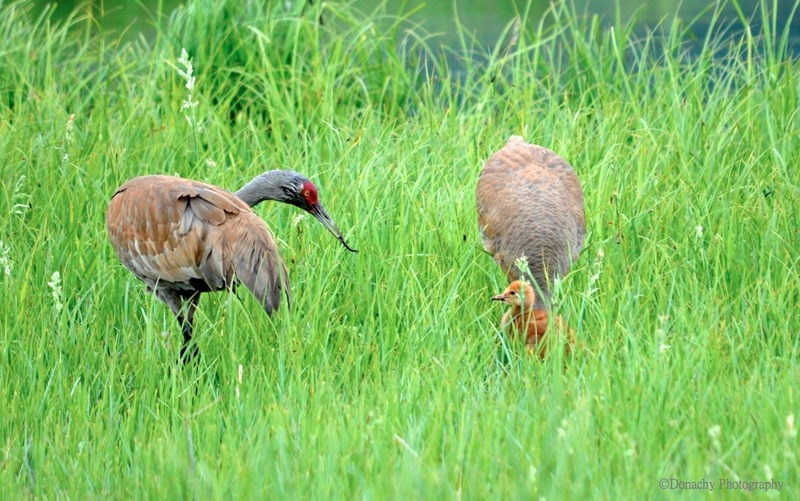 Large birds are cool, and in North America, there aren’t many birds larger than Grus canadensis, sandhill cranes. Adults typically weight 8 to 10 pounds. The stand four to five feet tall and have wingspans of five-and-a-half feet to nearly seven feet. Sandhills are fairly common in the west, and in a few places can be viewed by the hundreds or even thousands. More frequently, they are seen here and there in pairs, in small groups, or as individuals. 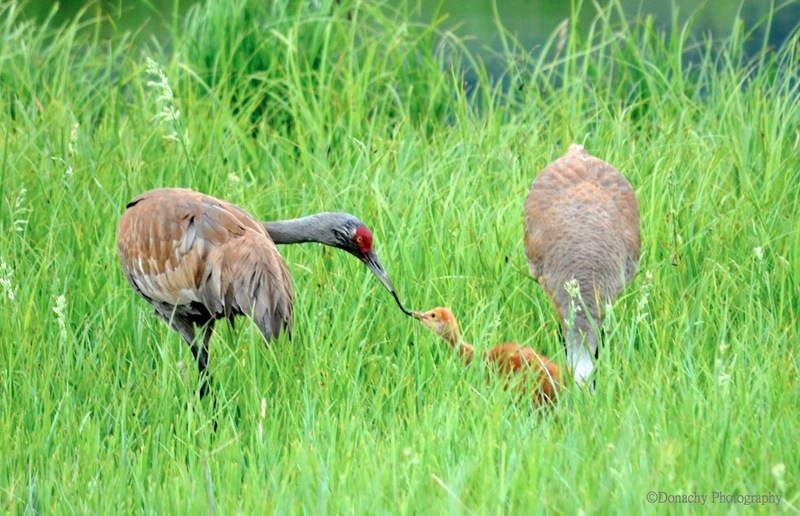 We couldn’t quite make out what the adult bird is feeding the chick. 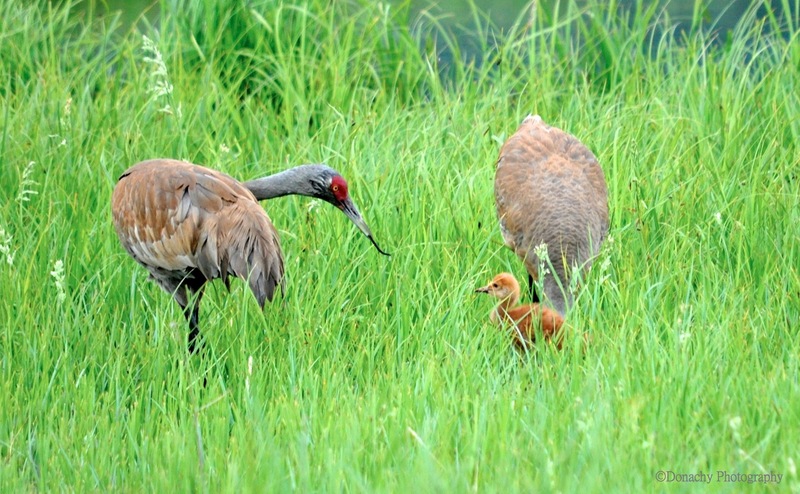 Cranes are catholic in diet. Berries and seeds make up a large portion of their diet, but insects and other small animals figure in as well. This chick will stay with its parents for 10 months or so – until just before next year’s breeding season when the parents will lay one to three eggs. 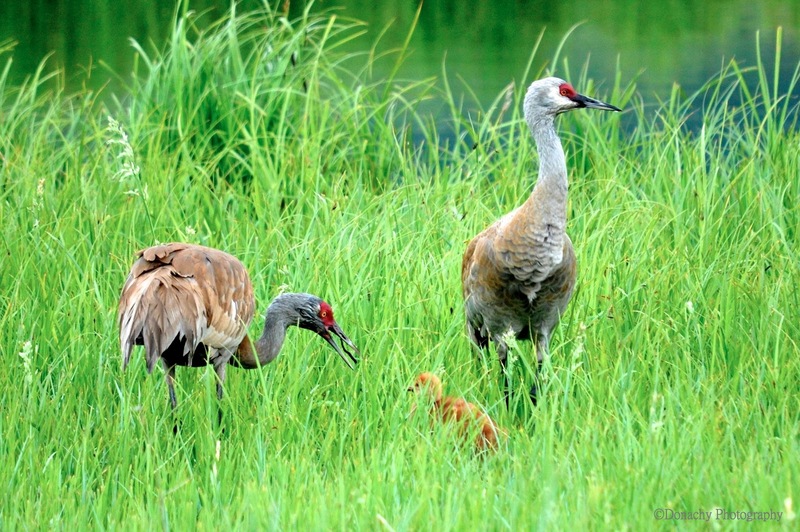 Sandhills have a life expectancy of about seven years in the wild, but may live up to three times that long. Several subspecies occur throughout the U.S. and across the Pacific to Siberia. Accidentals have been reported in Europe. We have the Sandhills in Florida during the winter. They act like they own the golf course and are being kind by letting you play through. They can squawk. Beautiful photos. I used to enjoy seeing animals on golf courses – though they can be inconvenient, like monkeys coming out of the jungle to steal your golf balls! The worst I had on a golf course was an alligator in SC two feet from my ball. Didn’t check the rule book, I took a free drop. Still looking for the LOVE button 😉 What great shots!